ISAAA develops an array of publications, videos, and presentation slides on various topics. These are available in hard copy, or in electronic format. Many of the materials are downloadable from ISAAA’s website. While most of the materials can be purchased online, hard copies are available for free to eligible nationals of developing countries. Major papers reviewing current developments in international biotechnology, sustainable agriculture, and technology transfer - a means for ISAAA to share its experience. Pocket Ks are Pockets of Knowledge, packaged information on crop biotechnology products and related issues available at your fingertips. The book entitled 50 Biotech Bites contains 50 topics relevant to the science, applications, and issues behind agricultural biotechnology. It is based on pocket-sized publications called Pockets K or Pockets of Knowledge which have been developed by ISAAA for the last 15 years. Each topic is discussed using "bite-sized" information to "feed" hungry minds and engage with others on the technology to make informed decisions about its adoption and use. The book shares the findings of ex-ante studies on the market prospects and potential economic, health, and environmental impacts of the insect resistant Bt eggplant in the Philippines. The book featured studies on pesticide use, costs and returns of conventional eggplant production, and supply chains in eggplant marketing in top eggplant-producing provinces in the country. Myths and Facts about Agricultural Biotechnology answers 10 myths on agricultural biotech, providing facts and data relevant to each topic. Beyond Promises: Facts about Biotech/GM Crops in 2017 is a visual presentation of the 10 important highlights about biotech crops from 1996 to 2017, taken from ISAAA Brief 53: Global Status of Commercialized Biotech/GM Crops: 2017. The report features the major activities, projects, and accomplishments of ISAAA aimed to advance the society towards agricultural sustainability and development. The book presents case studies that offer unique and rich examples of how countries have been able to guide through the 'drama' of crop biotechnology as they shepherd innovations from the laboratory, greenhouse trials, multi-location trials, and hopefully to farmers' fields. 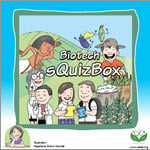 ISAAA releases the new version of Biotech sQuizBox (Not Just for Kids), an activity booklet on biotechnology. The publication is designed to inform the public on biotech through trivia and puzzles in cartoons. It also provides URLs and QR codes directing to more biotech information online. 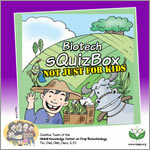 Biotech sQuizBox is an accordion-type cartoon publication that aims to inform secondary school students about crop biotechnology. One side of the booklet contains snippets of basic information about the history, development, and benefits of biotech crops. The other side of the booklet challenges the readers to answer exciting quizzes to further understand the subject matter. The activities include DNA extraction exercise, scientist appreciation activity, puzzles, and word problem, which can be done individually or as a group in science classes. Inside the Biotech Lab: How to Genetically Engineer a Plant? Inside the Biotech Lab: How to Genetically Engineer a Plant? is a visual documentation of how scientists conduct genetic transformation in the laboratory. The publication is based on a study conducted by ISAAA and SEARCA Biotechnology Information Center published in the April 2017 issue of Philippine Journal of Crop Science. The quotes are taken from ISAAA Brief 50 Voices and Views: Why Biotech? which highlight the perspectives of various key stakeholders from Africa, Asia, Europe, and North America who have followed the advancement of biotechnology and are convinced that the technology is vital in improving the quality of life. In the eyes of the public, academics and scientists are at the topmost level of the credibility ladder, being the most relable and trusted sources of information on biotechnology. To know how academics and scientists play their role in biotech communication, a study was conducted by ISAAA. The results of the study are published in the August issue of Philippine Journal of Crop Scienc. The highlights of study is packaged in this monograph. A collection of farmers' testimonies from China, India, and the Philippines, about how they started adopting biotech crops, how they benefited from the technology, and why they continue planting biotech crops. This monograph highlights the research findings of a study to determine how cartoonists in Philippine national newspapers "define" biotechnology. In addition, it discusses Biotechtoons, a contest for cartoonists on biotechnology, and initiatives by other countries to help popularize technology concepts and issues. The study underscores the relationship between science and media and the process of negotiating public or popular images of science. It analyzed media coverage, sources of articles, tone, media frames, use of metaphors, and article titles. ISAAA and the Malaysian Biotechnology Information Centre (MABIC) releases this brochure that shows the activities of a week-long activity to introduce the wonders of science in a playful, relaxing, and participative mode. This brochure is a synthesis of Brief 40 on Communicating Crop Biotechnology: Stories from Stakeholders. It highlights how different audiences respond to science communication efforts, thus building a collective voice on crop biotechnology. The novel educational cartoon publication "Mandy & Fanny : The Future of Sustainable Agriculture" illustrates the attributes of biotech/genetically modified (GM) crops –biotech maize (corn) and biotech cotton and are viewed as the "Tom and Jerry" of modern biotech agriculture. The rationale for creating the cartoon around biotech crops is to spread the factual messages about biotech crops as the popular media is rife with misinformation on biotech crops. Mandy and Fanny pay a visit to Kenya and are surprised by the negative publicity in the media.They decide to take an educational tour of the country and interact with major stakeholders: Government representatives, Politicians and opinion leaders, Journalists, Farmers, and Consumers. During the tour, they provide useful insights on biotechnology and its benefits as well as correct the misconceptions about crop biotechnology. The booklet discusses in detail and in simple language agricultural biotechnology as it compares with conventional breeding, the agricultural biotechnology tools used in crops such as tissue culture and micropropagation, molecular breeding and marker-assisted selection, and genetic engineering and GM crops. A section on Answers to Frequently Asked Questions for food safety and environmental issues was also included to clarify important public concerns. Country Biotech Facts and Trends are one- to two-page summaries that highlight the commercialization of biotech crops in the developing countries. Data on biotech crop commercialization (hectarage and adoption), approvals and planting, benefits and future prospects in each country are presented in a brief and easily understandable manner. The contents are all based on the annual ISAAA Brief on the Global Report of Commercialized Biotech/GM Crops. Short documents on adoption, adopting countries, traits and benefits of major biotech crop. The publication includes short discussions about the trends in biotech traits adoption and benefits of biotech crops with such traits. ISAAA Series of Biotech Crop Profiles featuring a comprehensive overview of the adoption, impact and future prospects of biotech crops in developing countries. The book Developing a Biosafety Law: Lessons from the Kenyan Experience seeks to document the development of the Kenya Biosafety Law and its progress through three Parliaments and two General Elections. The authors strongly believe that the enactment of science-based biosafety legislation should be guided by facts, education, collective action and inclusion of all interested parties. The book also provides an analysis of the lessons learnt and how this can benefit other developing countries that are yet to have an equivalent law in place. The book presents the projected level and distribution of costs and benefits associated with the featured biotech crops based from a series of ex-ante impact assessment studies supported by the Agricultural Biotechnology Support Project II (ABSPII) and the International Service for the Acquisition of Agri-biotech Applications (ISAAA). The book is co-published by ISAAA and the Southeast Asian Regional Center for Graduate Study and Research in Agriculture (SEARCA). Peer and kinship systems facilitate the adoption and uptake pathways of biotech corn in some provinces of the Philippines, that is according to the researchers at the University of the Philippines Los Baños. They conducted a survey in 2011 to analyze how biotech corn farmers started to adopt the technology and to understand the role of communication in the farmers' decision to adopt and share information about the crop. Communicating Agricultural Biotechnology in Africa: What Role for Radio? The brief captures findings of a research project conducted by Africenter and partners from 2008 to 2011 on Radio use in communicating agricultural biotechnology in Africa using Burkina Faso and Kenya as case studies. The two countries have recorded increased activity and growth in research, development and policy formulation in agricultural biotechnology over the last 5 years. The booklet captures some key developments in agricultural biotechnology in Africa. The document narrates notable scientific breakthroughs, political support, policy formulation, capacity building and awareness creation on agricultural biotechnology in Africa. It highlights activities in three African countries (South Africa, Burkina Faso and Egypt) that have commercialized biotech crops and are now experiencing socio economic benefits as well as improved environmental conservation. This publication aims to provide a comprehensive and up-to-date status of the field trials and commercialization of biotech crops in India in 2008. It also includes the most authoritative coverage and statistics of Bt cotton, including hectarage of Bt cotton hybrids planted in India, numbers of farmers growing hybrids and approval of different events and hybrids in India from 2002 to 2008. This publication highlights the significance of the seed and new crop technologies. It captures the experiences of three key developments in Indian agriculture that sustained growth in agriculture, contributed to increased food production and the alleviation of poverty and hunger. "Genes are Gems" is a collection of knowledge and wisdom gained from media workshops organized by the International Crops Research Institute for the Semi-Arid Tropics (ICRISAT) and supported by the International Service for the Acquisition of Agri-Biotech Applications (ISAAA) and the United Nations Educational, Scientific and Cultural Organization (UNESCO). It will surely be a handy reference book for science communicators and journalists. These studies were conducted to determine the stakeholders' socio-demographic characteristics, worldviews and values, information sources as well as their level of understanding and perception of, and attitude towards agricultural biotechnology.